Ossian (; literary falsehood in modern history." The work was internationally popular, translated into all the literary languages of Europe and was influential both in the development of the Romantic movement and the Gaelic revival. "The contest over the authenticity of Macpherson's pseudo-Gaelic productions," Curley asserts, "became a seismograph of the fragile unity within restive diversity of imperial Great Britain in the age of Johnson." Macpherson's fame was crowned by his burial among the literary giants in Westminster Abbey, and W.P. Ker, in the Cambridge History of English Literature, observes that "all Macpherson's craft as a philological impostor would have been nothing without his literary skill." In 1760 Macpherson published the English-language text Fragments of ancient poetry, collected in the Highlands of Scotland, and translated from the Gaelic or Erse language. Later that year. Macpherson claimed, he obtained further manuscripts and in 1761 he claimed to have found an epic on the subject of the hero Fingal, written by Ossian. The name Fingal or Fionnghall means "white stranger". According to Macpherson's prefatory material, his publisher, claiming that there was no market for these works except in English, required that they be translated. Macpherson published these translations during the next few years, culminating in a collected edition, The Works of Ossian, in 1765. The most famous of these Ossianic poems was Fingal, written in 1762. The poems achieved international success. Napoleon, Diderot and Thomas Jefferson were great admirers, and Voltaire wrote parodies of them. They were proclaimed as a Celtic equivalent of the Classical writers such as Homer. Many writers were influenced by the works, including the young Walter Scott, and painters and composers chose Ossianic subjects. One poem was translated into French in 1762, and by 1777 the whole corpus. In the German-speaking states Michael Denis made the first full translation in 1768-69, inspiring the proto-nationalist poets Klopstock and Goethe, whose own German translation of a portion of Macpherson's work figures prominently in a climactic scene of The Sorrows of Young Werther (1774). Goethe's associate Johann Gottfried Herder wrote an essay titled Extract from a correspondence about Ossian and the Songs of Ancient Peoples (1773) in the early days of the Sturm und Drang movement. Complete Danish translations were made in 1790, and Swedish ones in 1794-1800. 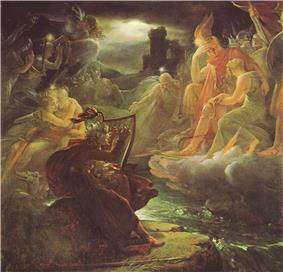 In Scandinavia and Germany the Celtic nature of the setting was ignored or not understood, and Ossian was regarded as a Nordic or Germanic figure who became a symbol for nationalist aspirations. The French general Jean-Baptiste Bernadotte, who was made King Charles XIV John of Sweden and King of Norway, had already named his only son after a character from Ossian; born in 1799, he later became King Oscar I of Sweden and Norway, and was succeeded by his son Oscar II (d. 1907). By 1800 Ossian was translated into Spanish and Russian, with Dutch following in 1805, and Polish, Czech and Hungarian in 1827-33. The poems were as much admired in Hungary as in France and Germany; Hungarian János Arany wrote "Homer and Ossian" in response, and several other Hungarian writers – Baróti Szabó, Csokonai, Sándor Kisfaludy, Kazinczy, Kölcsey, Ferenc Toldy, and Ágost Greguss, were also influenced by it. The opera Ossian, ou Les bardes by Le Sueur was a sell-out at the Paris Opera in 1804, and transformed his career. The poems also exerted an influence on the burgeoning of Romantic music, and Franz Schubert, in particular composed Lieder setting many of Ossian's poems. In 1829 Felix Mendelssohn was inspired to visit the Hebrides and composed the Hebrides Overture, better known as "Fingal's Cave". His friend Niels Gade devoted his first published work, the concert overture Efterklange af Ossian ("Echoes of Ossian") written in 1840, to the same subject. Johnson also dismissed the poems' quality. Upon being asked, "But Doctor Johnson, do you really believe that any man today could write such poetry?" he famously replied, "Yes. Many men. Many women. And many children." 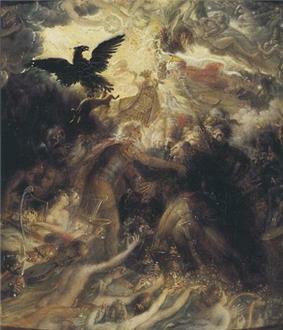 Johnson is cited as calling the story of Ossian "as gross an imposition as ever the world was troubled with". In support of his claim, Johnson also called Gaelic the rude speech of a barbarous people, and said there were no manuscripts in it more than 100 years old. In reply, it was proved that the Advocates' library at Edinburgh contained Gaelic manuscripts 500 years old, and one of even greater antiquity. The controversy raged on into the early years of the 19th century, with disputes as to whether the poems were based on Irish sources, on sources in English, on Gaelic fragments woven into his own composition as Johnson concluded, or largely on Scots Gaelic oral traditions and manuscripts as Macpherson claimed. The Invention of Scotland (2008) by Hugh Trevor-Roper follows the evolution of Macpherson's versions and the work's early support by some Scottish intellectuals. Works on paper by August Wilhelm Schlegel praised in a letter to Goethe, seem to have been lost, as has a picture by J.M.W. Turner exhibited in 1802. Henry Singleton exhibited paintings, some of which were engraved and used in editions of the poems. 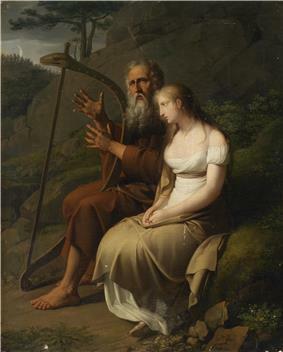 The Danish painter Nicolai Abildgaard, Director of the Copenhagen Academy from 1789, painted several scenes from Ossian, as did his pupils including Asmus Jacob Carstens. 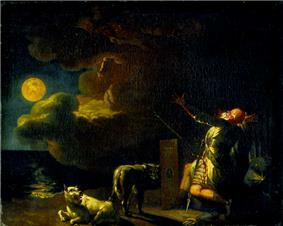 His friend Joseph Anton Koch painted a number of subjects, and two large series of illustrations for the poems, which never got properly into print; like many Ossianic works by Wallis, Carstens, Krafft and others, some of these were painted in Rome, perhaps not the best place to evoke the dim northern light of the poems. In Germany the request in 1804 to produce some drawings as illustrations so excited Philipp Otto Runge that he planned a series of 100, far more than asked for, in a style heavily influenced by the linear illustrations of John Flaxman; these remain as drawings only. Many other German works are recorded, some as late as the 1840s; word of the British scepticism over the Ossian poems was evidently slow to pentetrate the continent. 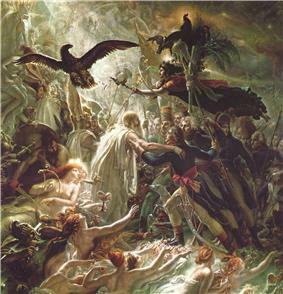 Girodet's painting (still at Malmaison; 192.5 x 184 cm) was a success de scandale when exhibited in 1802, and remains a key work in the emergence of French Romantic painting, but the specific allusions to the political situation that he intended it to carry were largely lost on the public, and overtaken by the Peace of Amiens with England, signed in 1802 between the completion and exhibition of the work. He also produced Malvina dying in the arms of Fingal (c. 1802), and other works. ^ Thomas M. Curley, Samuel Johnson, the Ossian Fraud, and the Celtic Revival in Great Britain and Ireland (Cambridge U.P.) 2009, Introduction. Curley outlines the activity of Samuel Johnson in debunking the "Ossianic" texts, and reviews the mass of scholarship regarding Macpherson's Ossian since. ^ "A Dissertation concerning the Aera of Ossian", published as prefatory matter in later editions of the poems. ^ Non-Fiction Reviews. Telegraph" review, 6 June 2008; seen on 29 May 2011""". Telegraph.co.uk. Retrieved 2012-04-04. ^ McNaughton, Peter (1887). "Poems of Ossian: Literally translated from the Gaelic, in the original measure of verse".". Edinburgh: William Blackwood and Sons. Retrieved 23 March 2014. ^ "Ossian Collection: Selected books from the Ossian Collection of 327 volumes, originally assembled by J. Norman Methven of Perth. Different editions and translations of James MacPherson's epic poem 'Ossian', some with a map of the 'Kingdom of Connor'. Also secondary material relating to Ossianic poetry and the Ossian controversy.". Edinburgh: National Library of Scotland. Retrieved 23 March 2014. Hanselaar, Saskia,« La Mort de Malvina du musée Auguste Grasset à Varzy : une œuvre de jeunesse réattribuée à Ary Scheffer », La Revue des musées de France - Revue du Louvre, LXIe année, octobre 2011, n°4, p. 87-96. 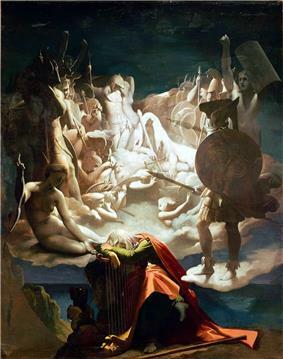 Hanselaar, Saskia, Ossian ou l'Esthétique des Ombres : une génération d'artistes français à la veille du Romantisme (1793-1833), Ph.D., dir. S. Le Men, Université de Paris Ouest Nanterre la Défense, 2008.